Alin and I are having a baby. Yes. It's true. Our baby is halfway to the finish line, healthy, and quite active. As we transition from just the two of us into a family, we will chronicle some of the more interesting moments during our journey. Be sure to check back for updates. You remember all that stuff they told you in school about how easy it is to get pregnant? Well, it's easy – but not THAT easy. Many women have this romantic vision of what pregnancy is supposed to be like. They have dreams of wearing cute pregnancy clothes, shopping for baby stuff, planning a baby shower, and so on and so forth. Too bad pregnancy symptoms define what you can and will do over the next 9 or so months. Exhibit A: Morning sickness. Exhibit B: Having to pee every 15 minutes. Exhibit C: Constant hunger. Exhibit D: Soreness, swelling, and other discomforts. Exhibit E: Emotional roller coaster. This list goes on. 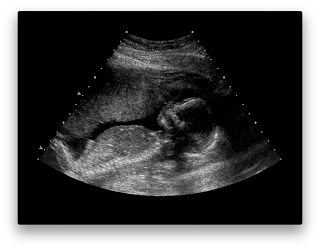 The first time you see your baby move during an ultrasound is the moment you both realize that yes, this is all real and it's happening to you – and it's completely scary and awesome at the same time. Deciding how to tell your family and friends that you're having a baby is, in fact, quite fun. We're not going to find out if it's a boy or girl, so don't bother asking. It's a surprise for one and all. Your TV viewing habits begin to change. Case in point: TiVo has these presets of shows you can record based on interests. The guide for "Stay at Home Mom" didn't really have anything new to add to Alin's TV schedule. You thought deciding what's for dinner was hard before. Try it when 90% of what you used to eat now makes you nauseous and the ingredients for remaining 10% never seem to be in your kitchen. Listening to your baby's heartbeat is an equally mind blowing experience. It's much faster than you imagined it would be. You thought you were in love before. Looking at each other and knowing you're having a baby that's part of both of you changes... everything. Our baby is due on Thanksgiving. Hurray for that! Just far enough from Christmas to ensure they'll always get both sets of gifts and the perfect holiday to ensure that family will be around to celebrate. Who could ask for anything more? Check out the official first photo of baby Gedikian. There's more to come, but we hope you enjoyed these tidbits.